If you are not 100 percent satisfied with our service, please contact a supervisor while our technician is still on your property because we want to make things right – right away. We guarantee that repairs on your equipment are accomplished properly. If a repair does fail, however, we will repair it again at no additional charge to you. Certain repairs are guaranteed for two years or the repair is free. We guarantee that the equipment we have installed will perform as we have stated. If the system’s performance does not operate in accordance with our proposal, we will make it right at no additional charge to you. We guarantee that the system(s) we have installed in your home will cool your home as we have stated. If the temperature range we have promised is not achieved, we will modify or replace the system at no charge to you. During your installation all affected parts of your property, such as lawns, shrubbery, carpeting, floors, walls, furniture and doorframes are protected. Protective shoe covers and hall runners will be used on all work traffic areas. We guarantee that matched home-comfort systems that are approved by our design engineers and installed by us will perform as we have stated. If the system does not heat or cool your home as promised, we will modify your system at our expense. Customer Respect: Our technicians will courteously answer any and all questions or concerns, and leave your home as neat as they found it. Code Compliance: The installation will comply with all existing local codes. We obtain the necessary permits, and the completed work will be inspected by the permitting agency. Drug Free: Our professional highly trained associates pass drug and background screenings before they ever step foot in your home or perform any work on your property. 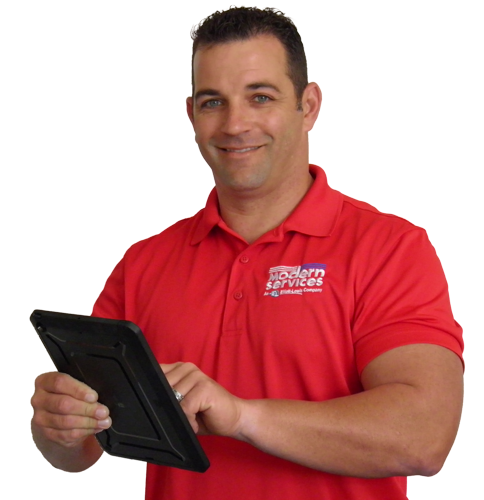 Choosing an air-conditioning and heating, or electrical company in Southwest Florida is an important decision. Modern Services is proud to share with you some of the positive experiences our customers have had over the years.